Thanksgiving is a wonderful time to take time out of our normally busy routines and be thankful for what we have. Of course, we appreciate our customers and are thankful for their business. If you’ve ever had a pipe emergency, you know to be thankful for trenchless technology. In case you haven’t, check out these top 4 reasons to be thankful for trenchless technology! Find out why to be thankful for trenchless pipe repair! Faster – Trenchless pipe repair means no large trench digging. For you, this means a faster sewer repair. Who wants a sewer repair crew in front of their home or business for several days or weeks on end? Trenchless pipe repairs can be often finished in only a few days, sometimes even less! Cleaner – Do you know where most sewer lines are located? Right under mature yards, beautiful floors, and expensive landscaping. Digging up sewer lines can ruin these yards, floors, and landscaping. Trenchless pipe repair only requires one or two small holes to be dug to reach the sewer lines, usually at the entrance and exit of the pipes, reducing the damage and clean up. 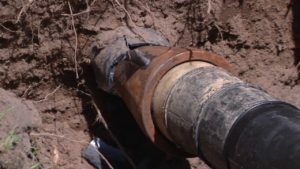 Better Quality – Trenchless pipe repairs use cure-in-place liners or full replacements may use seamless piping, both of which are a higher quality piping material. This trenchless technology gives a joint-free piping that prevents tree root evasions, cracks, and off set pipes. That means they last longer and require less future repairs. Better Function – In addition to lasting longer and needing fewer future repairs, trenchless pipe repairs and replacements using seamless technology that can actually improve the sewer systems function. Pipe liners and new, larger, piping can increase flow capacity. Have Your Own? Share It With Us! Do you have your own reason to be thankful for trenchless pipe repair? We’d love to hear it! Post it to our Facebook page or send us a tweet! Wishing you a happy Thanksgiving from the team at Trenchless Replacement Specialists!